The attacks illustrate that despite Kabul’s security blanket, the insurgency in Afghanistan is far from defeated. An Afghan policeman investigates the site after Taliban fighters attacked near Kabul airport this morning. SEVEN TALIBAN LEADERS with rocket-propelled grenades and machine guns launched a rare assault on NATO’s operational headquarters at the military section of Kabul’s international airport. All seven militants were killed. Gunfire and explosions from the pre-dawn battle could be heard in many parts of Kabul. No one was killed except the attackers, but it emphasised the challenges faced by Afghanistan’s fledgling security forces as they prepare to take the lead from a US-led coalition that is rapidly withdrawing its remaining forces. The spectacular attacks are aimed at demoralising the population and sowing mistrust in the Afghan security forces’ ability to protect their citizens — rather than military gains. The failed attack showed that despite an asphyxiating security blanket around the capital, Afghanistan’s insurgency is far from defeated after nearly 12 years of war, and militants can still menace the capital. “We can expect high profile attacks, we can expect insider threats and we can expect maybe some assassinations,” said German General Gunter Katz, spokesman for the US-led International Security Assistance Force. The Taliban, who claimed responsibility for the airport attack, have been testing Afghan security forces as foreign combat troops pull back more than a decade after the invasion to oust the Taliban regime for sheltering al-Qaeda after the September 11 attacks. In declaring their spring campaign, the Taliban said they would target Afghan and coalition forces and government officials around the country. Although they said they would not target civilians, the overwhelming number of dead and wounded so far has been ordinary Afghans. 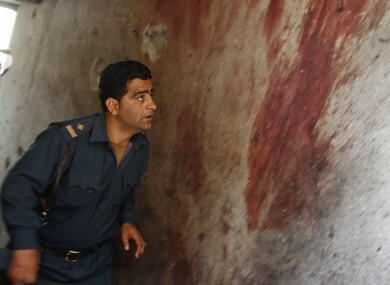 The attack was one of three against state facilities on Monday morning by insurgents around the country. In addition to the airport attack, six militants wearing suicide bomb vests tried to storm the provincial council building in the capital of southern Zabul province, while three attempted to attack a district police headquarters near the capital. Elsewhere, a roadside bomb killed a Polish soldier in the NATO force. Interior Ministry spokesman Sediq Sediqi said that in Zabul the attackers wounded 18 people, including three police officers, when they detonated a car bomb outside the building in the city of Qalat, but security forces shot and killed them before they could enter. On the outskirts of Kabul, police killed one attacker and arrested two others who tried to storm the headquarters building in the Surobi district. At the airport, the insurgents did not get close enough to attack aircraft and were not near the runway’s flight path. Even if they had managed to damage the airport, it would have affected civilian flights but not had an impact on military operations, which are carried out from a military airfield at Bagram about 30 miles north of the capital. But they did manage to sneak in a minivan full of explosives, rocket-propelled grenades, heavy machine guns and assault rifles along with their suicide vests. Such weapons have been used repeatedly in Kabul attacks over the recent months, including an eight-ton bomb on a truck in March that was discovered just before it was to be used to attack a NATO base. Afghan President Hamid Karzai said his government would not be deterred. “These cowardly terrorist attacks on the Afghan people cannot change the chosen path of the Afghan people toward progress, development, peace and elections,” Karzai said, referring to next spring’s poll to elect a new head of state. Karzai was not in Kabul during the attack, but was visiting the Gulf state of Qatar, where he was discussing his country’s stalled peace process and the possible opening of a Taliban office in Doha. Email “Seven Taliban leaders killed after assault on NATO airport base”. Feedback on “Seven Taliban leaders killed after assault on NATO airport base”.